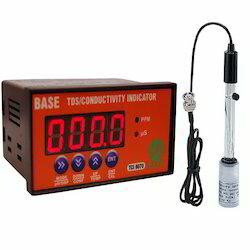 Conductivity Indicator provided automatic & Manual Temperature Compensation for Accurate Measurement. User Friendly Four soft keys are provided to configure all the parameters like Auto calibration mode, Temperature Compensation, etc., Conductivity Indicator are Micro Controller Based Very Accurate, Rugged, & Economical for continues online measurement for TDS, Conductivity and Temperature. Very High Input Impedance > 10¹² Ohms. Automatic Two Point Buffer Calibration. Universal Supply Voltage 90 to 270V AC / DC. 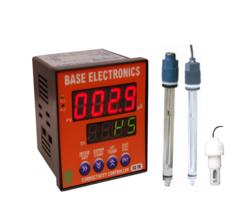 TDS Indicator indicates the amount of Total Dissolved Solids (TDS) in a solution. Since dissolved ionized solids like salts and minerals contribute to the conductivity of a solution, a TDS meter measures the conductivity of the solution then converts that figure to an estimated TDS reading.Ideal for all water purification applications and waste water regulation. Display:4 digit 0.5” 7 seg RED LED display. Range (any one):0-9999 ppm / µs (or) 0-99.99 ppt /mS. Parameter Status:2 Red LED Indication. Operating Environment:-10 to 50°C / 10 to 95% RH Non condensing. Power Supply:90 to 270V AC / DC 50Hz. Programmable Auto / Manual Temperature Compensation. pH Interface to PLC and Data logger. The pH indicator has provided automatic/Manual Temperature Compensation for accurate pH Measurement. User friendly four soft keys provided to configure the all the parameter like auto buffer calibration, temperature compensation, ORP calibration etc. Programmable Auto / Manual Temperature Compensation. pH user programmable parameters. Non – Volatile Memory retains all Stored parameters and Calibration Data, even if Power Failure. Oxidation-Reduction Potential(ORP) is a measurement that indicates the degree to which a substance is capable of oxidizing or reducing another substance.ORP is measured in millivolts (MV) using an ORP meter. Based very accurate, Rugged & Economical for continuous Online Measurement. It has high input impedance stage for Fast ORP / Temperature Measurement. Programmable Auto / Manual Temperature Compensation with LED indication. Very High Input Impedance > 10¹² Ohms and Accuracy. 2 Relay output with configuration H / L setting. TDS controller is a controls of the combined content of all inorganic and organic substances contained in a liquid in molecular, ionized or micro-granular suspended form.This TDS controller using as industrial TDS sensors, Temperature can be measured using temperature sensor. 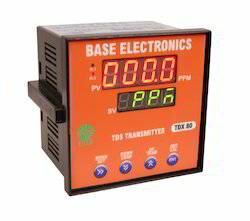 This TDS controller has many user friendly and safety. 2 Relay Output with configurable H / L setting. 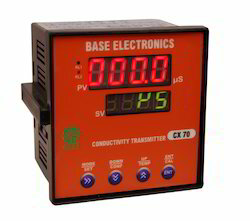 Conductivity Controllers are high performance digital indicating, dual set point, ON/OFF Controllers for conductivity, that use a temperature compensated conductivity probe. 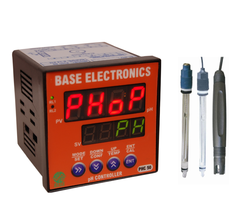 The overall conductivity indication and control range for the Conductivity Controller is 0 to 9999 µS/cm. Relay Output :Relay – 1 for setpoint -1, relay – 2 for set point – 2 with 5A rating. Re-Transmission O/P : Isolated 4-20mA (for selectable Lo& Hi limits (optional) Factory Presettable. Operating Environment: -10 to 50°C / 10 to 95% RH Non Condensing. 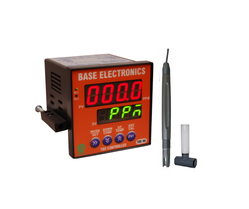 The pH Transmitter is designed to provide a standard 4 to 20 mA current output which is proportional to the pH being measured. Its small size and encapsulated construction allow for easy installation and will accommodate any pH electrode This pH monitoring and control system comprises an electronics transmitter module directly connected to an electrode which can be mounted integrally to the analytical transmitter .Local readout of process pH controller that is transmitted through the 4-20 mA loop powered cable. A simple interface makes set-up and configuration fast and easy. pH Transmitter offers accurate and cost-effective analytical measurement of pH, resulting in efficient control of process systems. 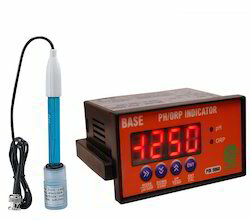 In addition, direct connectivity makes this pH monitoring and control system easy to fit into the process environment. The Online ORP transmitter is designed for use in harsh environments where moisture, dust, and chemical attack are prevalent. The ORX60 transmitter connected to the electronics module of the ORP electrode via a cable. 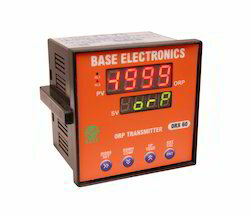 The ORP transmitter’s local display and keypad facilitate quick set-up and operational activities. Oxidation Reduction Potential Transmitter offers an accurate and cost-effective analytical measurement of ORP, resulting in efficient control of process systems. The highly advanced features of this ORP system make the transmitter easy to install, start-up, operate, maintain and highly cost effective. 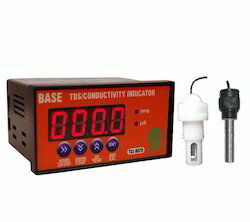 The Online TDS controller can measured using industrial TDS sensors, Temperature can be measured using temperature sensor. This TDS controller has many user friendly and safety. Each unit is configurable for a wide range of user applications from pure water to electroplating rinse tank conductivity control. 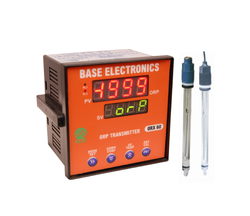 It is an economical meter for online measurement of specific TDS of solution using a TDS cell for R.O plant or D.M plant applications.TDX80 Series of TDS controller and Transmitter provides a reliable method of Transmitting 4-20mA for interfacing to PLC & Data logger. Conductivity Transmitter is designed to measure where moisture, dust and chemical attack may be present. The Analytical Transmitter modules are intrinsically safe in a weather-proof,corrosion-resistant sealed composite enclosure, and are ideal for industrial applications. The Analytical Transmitter easily integrates into any loop powered monitoring or control system. Its compact, plug-in modular design saves space, and with simple electrode placement. The 4-20 mA output cable easily connects to the module for easy wiring. All Conductivity cells are connected to the electronics module to the Conductivity cell via a cable. Thereby simple installation, start-up, operation, and maintenance tasks.Conductivity Transmitter provides a reliable method Transmitting 4-20mA with interfacing to PLC & Data logger.